How to create a company policy to address distracted driving. Each time you send/read a text message, or search, or check your email while driving you pose a potential risk for your company. 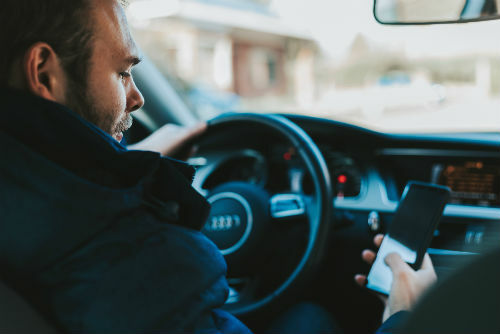 If an employee has a distracted driving – related accident while working (maybe while driving to a client meeting) the employer may be legally accountable for the consequences. This liability may include personal injury or death, property and equipment damage, and legal expenses and fees. The estimated total annual cost of vehicle crashes resulting from using cell phone use is $43 billion, according to a National Safety Council study. Commercial truck and bus drivers can be fined up to $2,750 for each related offense, and the employer is exposed to penalties of up to $11,000. Developing a strong distracted driving policy may help protect your company and your employees. An recent survey conducted by Aegis Mobility showed that 71% of 500 businesses contacted had a distracted driving policy in place. Before using a mobile device, safely pull over to the side of the road or, preferably, into a parking lot or rest area. Let all incoming calls go to voicemail and refrain from reading emails or texts until you’ve arrived. Don’t text , call or email any employee known to be driving. Enforce that the ban on mobile device while driving applies to all mobile devices, not just company devices. 2> COMMUNICATE & IMPLEMENT THE POLICY. Require each employee to attend training programs on distracted driving and its causes & consequences. Devise a place, such as an intranet site or even a corkboard, and encourage employees to share their ideas for preventing distracted driving. Reinforce the message periodically. It is not a suggestion; it is a mandate. Restate the consequences and penalties for breaching the policy. Conduct internal audits of distracted driving prevention and a safety culture. Track circumstances, such as managers calling employees who are driving, which may lead employees to disregard or ignore the policy. Refresh the policy as new practices are discovered. Supervisors and managers must watch for signs that employees may be overlooking distracted driving policies. Maybe, an increased number of low severity collisions or incidents while backing-up could expose the need for refresher training. Regardless, conducting annual communication campaigns to reinforce the importance of a safety-driven culture is mandatory.